1951-1957 Block Karen the Answer Doll, 12" tall, toddler doll, with a yes, no button, jointed body, straight legs, wigged, sleep eyes, closed mouth, doll is unmarked. 1951-1957 Block Twin dolls, Girl Answer Doll, (shown on right), 10 1/2" tall, toddler doll, with a yes, no button, both the boy and girl dolls have molded painted hair, sleep eyes, closed mouth, jointed body, straight legs, girl doll wears a navy skirt, boy has navy shorts, dolls are unmarked. 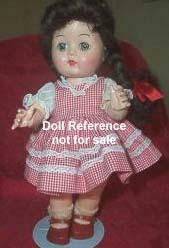 There are also (two) Block chubby 10 1/2" tall dolls, straight leg walkers with sleep eyes, do not have an answer button, dolls are unmarked. One of the dolls are called Baby Walker doll. 1951-1957 Block Answer Twin dolls, Girl Doll, 10 1/2"
1957 Block Little Miss Addie doll, 10 1/2" tall, (dolls are attributed to the Block Doll Corporation), Ad Dishwashing Detergent Company advertised the offer, "Little Miss Addie walks and moves her head. She moves her arms and closes her eyes. She has lovely blond hair you will love to comb and she is non-breakable. A $6.95 value for only $3.00 and an AD box top. She wears a pin striped taffeta dress, a hat and a real fur mink." 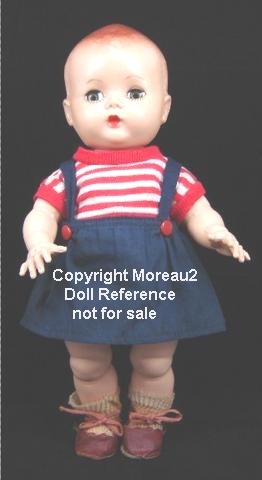 The doll is hard plastic, straight leg walker, sleep eyes, molded lashes with painted lower lashes and a saran wig. Dolls are unmarked. 1958 Block Little Miss Addie Sister doll, 8" tall, wide eyed, non walker doll, wore a matching dress. 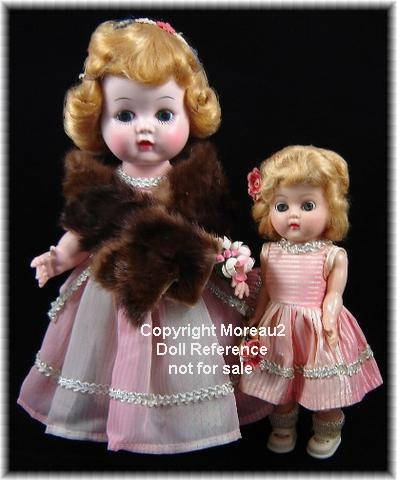 Photo shown, doll on left; Little Miss Addie doll 10 1/2" and on right; Little Miss Addie's Sister doll 8".